Is the Membership Card Doomed? In a world of ever increasing automation and digitisation, is the humble membership card doomed to disappear? In its traditional form as a credit card sized, barcoded piece of plastic, it’s days could be numbered. However, there are now so many more physical ID options out there, each offering their own unique benefits, that maybe there is life in the old dog yet…. Diners Club invented the very first charge card in the US in 1950, it was made of cardboard back then. A decade later American Express were the first to make their cards out of plastic and introduced the first PVC credit card to the UK in 1963. Ever since then plastic has been common place in our purses and wallets. The common plastic card has, until very recently, been at the core of most banking, membership, ID, access, loyalty and gift card schemes. Why have cards endured so long, in the face of what seems like more technologically advanced solutions? The answer, lies in the fact that the plastic card form has been able to ‘carry’ a range of technologies; from the humble barcode and magnetic stripe, through more secure tech like Chip & Pin and now to Contactless RFID and NFC. The card shape and construction has stayed more or less the same, but the technology has advanced significantly. More recently the card shape has also evolved, and the latest technology can now be carried in a fob for your keys, an adhesive sticker for your mobile phone or in wearable tech like silicone wristbands. These options all add another level of convenience to the user, as they no longer need to dive into their purse or wallet to produce a card. In the leisure industry this convenience has been particularly important, as operators want to speed customers through their facilities with as little inconvenience as possible. This year for the first time some of our operators are starting to make instant returns on investment, by retailing these multifunctional types of RFID to their members. And guess what? Members are happy to pay a one-off extra cost of few pounds to upgrade from a boring old plastic card, to realise the convenience and added benefits of being able to access the building (potentially 24 hours a day), swipe into classes, open and close their locker, login to their fitness kit, go for a swim and pay for a coffee; all from a stylish, well packaged wristband which they may even choose to wear all day, promoting not just your brand but as a badge of honour, broadcasting their own fitness and lifestyle aspirations to friends and colleagues. Can all this be achieved with a bio-metric thumb print, a facial scan or mobile app? Not quite the same is it? What about the future? Mobile is of course playing a huge role in all our lives now, with more and more applications being embedded in them. Could this replace the membership card? – potentially, yes. It hasn’t yet though, and smart phones have been around for over 10 years. Why? Because there are still certain limitations with mobile as ID: When looking for speedy access control do you want members having to stop and launch an app to get though the turnstile, or is a quick tap with a branded RFID sticker on the back of the phone a faster and slicker solution? Also, how quickly could a mobile QR code/ticket be screen grabbed and shared around a WhatsApp group? When you want to store your valuables in a locker and go for a swim/sauna/steam, can you take your phone with you? Or is a waterproof wristband a better option? Biometric technologies certainly have their place, and will no doubt become more mainstream in the coming years. Currently they are still not 100% reliable and many have difficulty scaling up to accommodate the size of databases many of our operators deal with. Will we ever get to the stage where every door, locker, running machine and point of sale have an integrated biometric reader? Unlikely, considering the cost of the hardware compared to the relatively cheap RFID / NFC readers (which are now being built into all sorts of consumer devices, from watches to speakers to cars). And in an age of security concerns around data and identity theft, do we really want to have our biometric details stored on third party applications being accessed so openly and regularly? That’s a personal choice we will all have to make. With further advances in wearable, proximity, RFID, NFC and Bluetooth technology happening all the time, huge corporations like Disney have been heavily investing in this type of tech. Just see what their Magic Bands can do. 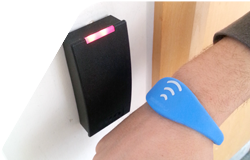 It is genuinely exiting to see what is possible with a wristband, a few readers and some very smart software. Much of this functionality is based around real-time location tracking. What could we do with that sort of data? What new applications and services could we develop with all this live information at our fingertips? What are the next level of usage reports we could deliver? We are already thinking about the answers to these questions at Gladstone. In extreme cases some companies are already microchipping employees (voluntarily, I hasten to add) with passive RFID tags under their skin. This allows the employee to gain access buildings, log into pc’s and even start cars, all with just a wave of the hand. Arthur C Clark said “Any sufficiently advanced technology is indistinguishable from magic”. This is pretty close. When it comes down to it, your customers will decide what works best for them and their lifestyle. What will Generation Z expect in 5 or 10 years’ time? Take Amazon Go – an advanced retail store with no tills or cashiers. You just swipe to enter, take what you want and leave - you are then charged for the items you have taken. The concept is what Jeff Bezos calls "Just Walk Out." Could a similar concept work in leisure centres? Where users are tracked around the facility and simply pay for the duration of time they spend accessing each activity, service or experience. And in this type of environment, would the very concept of memberships even be required? We will need to listen to the next generation, be aware of what other industries are doing and offer a range of ID choices that make life intuitively easy for the consumer. At the moment it looks like a lot of that technology will require some sort of physical ID to join up the customer journey around our facilities and provide a slick service ‘from front door to gym floor’. 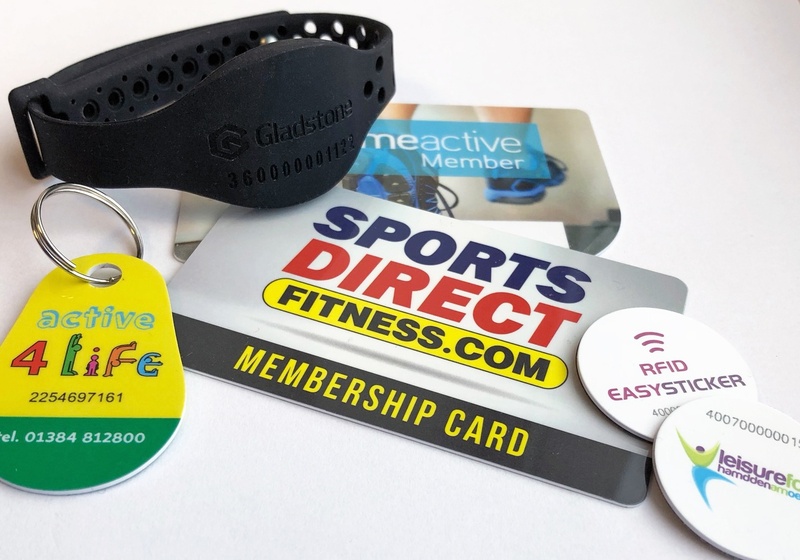 So, whether it’s a card, a keyfob, a mobile phone sticker, a wristband… or an implant, it looks like Membership ID is here to stay, for a while anyway. Get in contact with the Gladstone Card and ID team to find your next step. Request samples and bespoke branding services, get in touch with the team!